It is a large, erect, dense, perennial tufted or tussocky grass (2-4 m high). Leaves are up to 1 m long and have razor-sharp edges, rough ribs, with hairs on the ligule (small appendage at the base of the leaf). The blade is folded while it is a bud. Dead leaves generally stay attached and build up around the base of the plant. Inflorescence (group of flowers) is large silky and plume-like (panicle) held just above the leaves on a long slender stalk. The plume is usually silvery white to pink. Male and female flowers mostly occur on separate plants, however some flowers may be bisexual. Male flowers are hairless while female flowers have long silky hairs. Cortaderia selloana (pampas grass) may be confused with Cortaderia jubata (pink pampas grass) however the flowering stems of pampas grass barely extend above the top of the leaves whereas pink pampas grass stems extend well above the leaves. 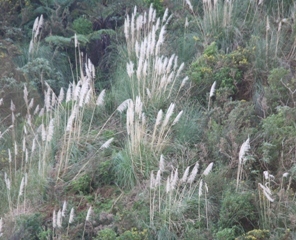 The plume (inflorescence) of pink pampas grass is pinkish when young but fades as it matures. The sharp edges of the leaves make this plant easy to distinguish from other look alikes.